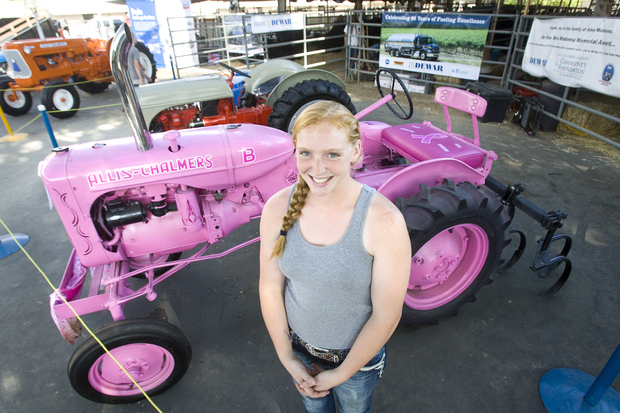 Our 2014 award winner, Sarah Stafford, with her pink tractor. The Caroline Huetter Foundation is happy to announce that we have selected Sarah Stafford of Atascadero, CA, to be this year’s award recipient. Last year Sarah decided to restore an antique tractor for a local contest sponsored by JB Dewar’s, however her 1948 Allis Chalmers Model B “pink tractor” soon grew into a campaign to help raise funds and awareness for the Cancer Support Community’s Breast Cancer Care Fund, a local non-profit that provides financial and emotional support for breast cancer patients on the Central Coast. So far the tractor and Sarah’s efforts have helped raise over $6,000 for the organization. 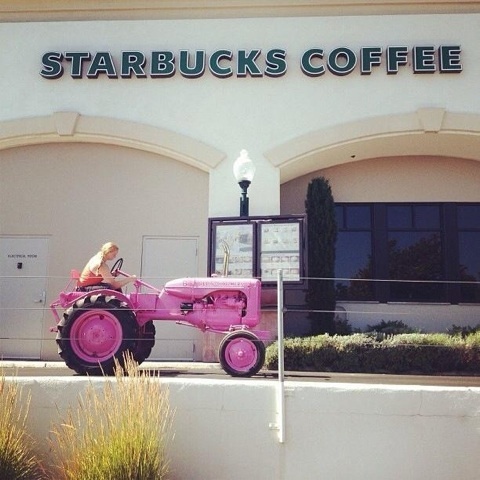 Sarah showing off her working tractor around town, and raising awareness for the Central Coast Cancer Support Community. Sarah also competes in shot put and discus on the track team at Atascadero High School, and is active in many community organizations around the Central Coast, including coaching basketball and floor hockey for the Special Olympics. Sarah has also continued to fix up and donate tractors to causes; she is now on her third tractor, to be donated to Jack’s Helping Hand, an organization that helps families of children with life-threatening illnesses or disabilities. Coach Sarah with her Special Olympics team after a big win. If you know of a young individual who would be a worthy recipient for next year’s award, please nominate them; you can find out more by visiting our nomination page.